Jennifer Egan's spellbinding novel circles the lives of Bennie Salazar, an aging former punk rocker and record executive, and Sasha, the passionate, troubled young woman he employs. Although Bennie and Sasha never discover each other's pasts, the reader does, in intimate detail, along with the secret lives of a host of other characters whose paths intersect with theirs, over many years, in locales as varied as New York, San Francisco, Naples, and Africa. We first meet Sasha in her mid-thirties, on her therapist's couch in New York City, confronting her longstanding compulsion to steal. Later, we learn the genesis of her turmoil when we see her as the child of a violent marriage, then a runaway living in Naples, then as a college student trying to avert the suicidal impulses of her best friend. We meet Bennie Salazar at the melancholy nadir of his adult life-divorced, struggling to connect with his nine-year-old son, listening to a washed up band in the basement of a suburban house-and then revisit him in 1979, at the height of his youth, shy and tender, reveling in San Francisco's punk scene as he discovers his ardor for rock and roll and his gift for spotting talent. We learn what became of his high school gang-who thrived and who faltered-and we encounter Lou Kline, Bennie's catastrophically careless mentor, along with the lovers and children left behind in the wake of Lou's far flung sexual conquests and meteoric rise and fall. A Visit from the Goon Squad is a book about the interplay of time and music, about survival, about the stirrings and transformations set inexorably in motion by even the most passing conjunction of our fates. In a breathtaking array of styles and tones ranging from tragedy to satire to Powerpoint, Egan captures the undertow of self-destruction that we all must either master or succumb to; the basic human hunger for redemption; and the universal tendency to reach for both-and escape the merciless progress of time-in the transporting realms of art and music. Sly, startling, exhilarating work from one of our boldest writers. This book was so much different than what I expected. I certainly wasn't expecting a narrative told in separate connected stories (think: Olive Kitteridge, The Tsar of Love and Techno), that's for sure. It's a bold approach, and it works. The back cover of the book does a pretty apt job explaining it: it's about aging punk rock record executive Bennie and his younger troubled assistant, Sasha. It's indirectly about them, at least. After starting off with stories focused on Bennie and Sasha as the main characters, the other stories are about people who knew them throughout their lives. Bennie and Sasha serve as the connecting thread that binds everyone together. This kind of narrative is gutsy because you have to make sure a) each story is interesting in its own right while b) holding the reader's attention with so many different characters and c) maintaining enough of a connection to the central characters that it doesn't feel random. Here, Egan succeeds on all fronts. With captivating characters and intellectually stimulating prose, she kept me fully engaged and eager to read each succeeding story. She even plays around with form in an exhilarating way; one story (one of my favorites) is told as a sort of PowerPoint presentation from the perspective of a young girl. I enjoyed this book immensely in spite of not connecting with it emotionally as much as I did intellectually. I REALLY wanted to love this story. I thought I would. Typically, any book that involves the music biz with its myriad characters that come in every shade and style of humanity completely engrosses me. I love the irreverence, the wild ride of rock & roll mixed with the roller coaster that is life in the city, life growing up, life in the push and pull of families; heartache, mental illness, etc., so this should've knocked my socks off. I wanted it to, but it didn't. Maybe it was my state of mind, I don't know, but there was not one emotional punch that landed with me. The characters were cleverly constructed, with lots of smart dialogue and angst-ridden plot points, but I was not moved by a one. And, frankly, even after repeatedly checking the book description to remind myself of who characters were and what they were supposed to be doing, their outlines somehow kept disappearing in the meandering narrative. I couldn't keep them straight, and their vignettes and individual chapters (often with bouncing time-lines and seemingly little connection) were indistinct and, for me, ultimately forgettable. At times I felt the writer was working too hard to be clever: the Power Point display towards the top of the third act (or maybe the third of four acts?) was likely meant to convey some sort of meaning, but on an e-reader it was illegible and though a weblink was offered, even that suggestion was emblematic of the problem: the device took me out of the story; it was pages and pages and pages, and had I actually left my book to go look at this on a website, I'd've LITERALLY been taken out of the story! As it was, I skipped ahead, just wanting to grab onto some thread that kept me as connected as possible to the difficult-to-follow narrative. For me it never got there. There were some interesting, well written sections, but it wasn't cohesive enough to really impel this reader forward to find out what was going to happen. I did get to the end...and then...it was over. That was about it. It left no mark. All art is subjective, I understand that, and clearly this is a case where my perspective is somewhat out-of-sync: Egan has won enough awards for this book, including the Pulitzer Prize, to make clear that whatever has eluded me was less of a problem for others! So be it. She is a skilled writer, with a mastery of language, and this may just be one piece of her work that did not resonate. Perhaps another of her books will. Not only is the writing unobtrusively perfect, but the structure of this book is a delightful mystery. Complete characters, inventive presentation...a treasure for literature lovers! I bought this book after reading a review in The New Yorker. It was a positive review, so I decided to give her earlier works a try. I am very disappointed. I knew it was supposed to be kind of hip, but in fact it felt clumsy and self-conscious. I realize the book sold well, but I'm sure I won't be reading any of her more recent works. 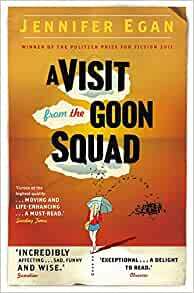 It’s not a spoiler to say that in Jennifer Egan’s A Visit from the Goon Squad, time is the “goon” of the title. Her inventive book ranges from several decades in the past to the almost-here future. Although two main protagonists are at the center, readers encounter the relationships and careers of a dozen characters whose lives are potholed by disappointments followed by regrets — or shrugs; lost love; tattered dreams crazily quilted by rare comebacks; and always the sound of encroaching youth eager to trample over their elders. Despite this bleak summary, the book is filled with humor, imagination, spot-on social skewering, and radiant shafts of beauty. Egan has empathy for her characters. They are flawed, some seriously, yet evoke sympathy if not affection. The narrative is alternatively presented as linked stories or a novel, it’s only problem. If, like me, you prefer to read each story in a collection independently, taking breaks between them, you may lose track of the characters, even the two main ones. If, on the other hand, you’re looking for the coherence of a novel, you may be frustrated by the dropped stitches and loose threads. Perhaps the book should be read twice, once each way. Reader’s choice whether the story mode or novel mode comes first. Either way, this complex and masterful book justifies a second reading.